Don’t wait ’til the weekend. Tuck in to our tribute to the Sunday roast with gravy flavour and beef from The Well Hung Meat Company. A perfectly seasoned blend of meaty lobster and South Devon chilli Farm chillies, for crunch after crunch of intense flavour. We’ve hand cooked quality potatoes to crisp perfection, before flavouring them with a unique blend of roasted barley and hops. 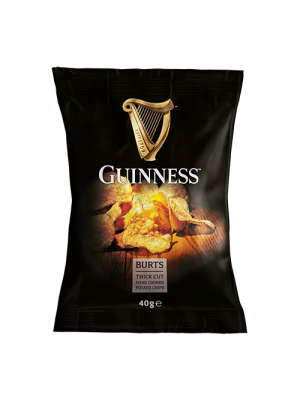 The result is a mouth-watering crisp with the bitter sweet flavour of the iconic Irish stout. Five different varieties of peppercorns, crushed and combined with natural flakes of sea salt. Job done. A classic combination of malted vinegar with a sprinkling of sea salt. Sit back and be transported to the great British seaside. Seasoned with a pinch of natural sea salt for a truly tasty flavour. They’re everybody’s favourite – that’s why they’re our bestseller. Seasoned with a pinch of natural sea salt for a truly tasty flavour. They're everybody's favourite - that's why they're our bestseller. Using real bacon from spoilt pig, indulge in the mouth watering flavours of smoked crispy bacon.